Lucy Stone Co-op invites our wider community to join us for dinner and singing every Sunday night. Vegetarian dinner is served at 7pm. If it’s not inconvenient, please bring a dish or beverage to share. 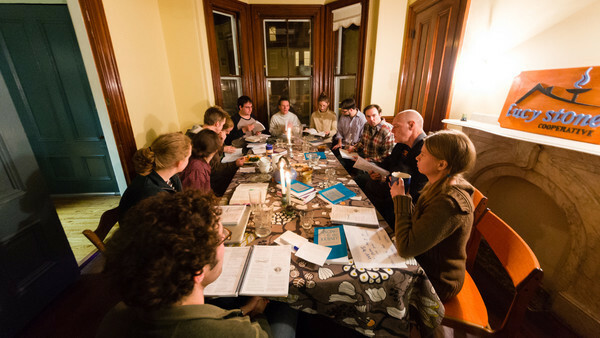 After dinner we sing together from Rise Up Singing, the UU hymnals, or any other song you want to share! Singing is roughly from 8-9pm and usually, but not always acapella. If you would like to join us, please just give us a heads up at admin@uucommunitycoops.org. I would love to join you for a meal and singing on March 8th. Will definitely bring food or a beverage. Does that work for next week? Yes! You would be most welcome. Please email info@lucystonecoop.org for address and details. Hi, I would love to join you for a Sunday night dinner. However, the email address is not working for some reason. Is there another way to connect? Apologies! Please try admin@uucommunitycoops.org – so sorry that that address seems to not be working.